The prime amenities include free Wi-Fi complimentary breakfast and in-room mini-fridges and microwaves at the non-smoking SpringHill Suites by Marriott Bellingham. The non-smoking SpringHill Suites is home to 122 suites spread over five floors. All accommodations are outfitted with free Wi-Fi iPod docks and 42-inch HDTVs plus homelike amenities such as sofa beds microwaves coffeemakers and mini-fridges. Come morning newspapers and the buffet breakfast are on the house. After eating check with the concierge for directions before exploring the area. On-site recreation options include an exercise room and indoor pool. 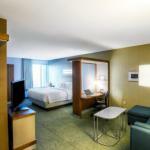 On the practical side the hotel offers a business center free parking and on-site laundry facilities. Pets are permitted for a fee. Downtown Bellingham is two miles from the SpringHill Suites which sits off I-5. It's 20 minutes from the Canadian border. Take a hike to see the waterfalls at Whatcom Falls Park or get on a bike to explore the Interurban Trail each 10 minutes away. Unique shops await in the Fairhaven Historic District less than 15 minutes from the hotel. Mount Baker Theatre the Spark Museum of Electrical Invention and the Heritage Flight Museum are all within four miles of the hotel. Bellingham International Airport is two miles away and the Amtrak Station is eight miles.